Weather apps are kind of a new world for me. I usually just step out of the house, feel the weather against my skin, and keep on walking. Others will check out weather apps, look at their indoor/outdoor barometers, do some calculations, then dive inside of their walk-in closet for their climate appropriate ensemble. Who am I kidding—that’s basically everyone. It’s a no-brainer that so many would crave even more data to combat the forces of mother nature, and that’s why there’s so many weather apps out there. Here are some of the best ones. Yahoo Weather draws from a reliable database that’s going to be around as long as Yahoo— a company that may or may not be immortal breath. The interface is clean and provides you with the basic day-to-day (or week-to-week) information without getting too detailed. It’s slightly better than the in-house app, but not quite as in-depth as some other programs. For most of you out there who just want to check the temperature that’s fine, but it also provides a small listing for wind pressure and the arc of the sun, if you need those tidbits for any reason. White on black is easy to read, as is the bold, but not too in your face choice of font. 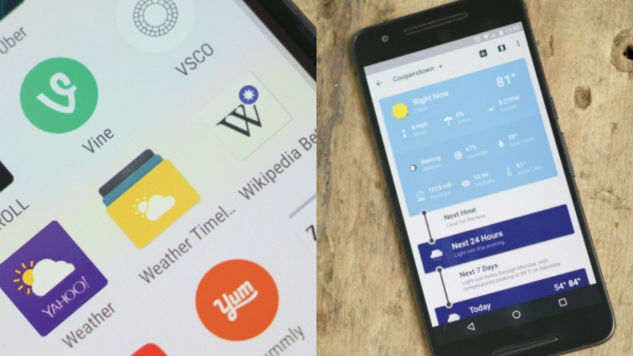 Give it a shot as your basic upgrade before you pay any amount of money for a weather app. If you’re into going outside a lot—whether it’s related to your job or just for pleasure—it’s helpful to know if it’s going to rain. A lot of apps give decent guesstimates with percentage points, but RainAware is wholly enveloped in the world of rain and storms—it’s what it does best. I thought it would be interesting to see if I needed to bring an umbrella along with me or if I needed to wait for an hour or so to take a walk, but I found RainAware to be much more useful than that. It’s great at tracking storms that could be dangerous to be out on the road in, and provides a rough estimate of storm paths. It’s one of those things you’ll want to literally have in your back pocket if you’re in an area that’s close to a body of water, especially coastal towns. It doesn’t have the most modern design, but if it’s useable enough for the in-depth info it gives. It might not be the easiest app to use, but Weather Underground provides access to a lot of data with helpful visuals like pie charts and other graphics. There’s a ton of info to sift through, but it draws its data from hundreds of thousands of weather stations to provide local information. The data is bound to have some rough edges, but you’ll probably find yourself flipping through it all regardless. The key is customization. Every facet of Weather Underground can be morphed to suit your needs, so if you don’t typically care about one aspect you can eliminate it entirely. It’s for that reason that the interface is so forgiving over time, because slowly but surely you’re able to mold the app into aspects you find most important. To go a step further, you can delineate data all day long with RadarScope. Self-described as a meteorologist-ready tool, this app just throws all of the data your way and hopes it sticks. Having used it for a few weeks, the power it wields is far beyond my pay-grade. Some of the information pertains to storms we may never even see, and is mostly only useful for pilots of small planes to circumvent turbulence. Then again if you live in a hurricane-heavy zone it might be useful to have the most tools at your disposal just in case so you can make the best decision—but for most folks you won’t need to spend the cash. It’s one of the most expensive apps in the entire weather space, but if you’re really into the idea of knowing everything you can or are a weather enthusiast, RadarScope is what you’ll want. Out of all of the apps I’ve tested out, Dark Sky is the total package. It sports a great interface, detailed reports (partially based on user feedback), and although it focuses on precipitation, it does general weather heavy lifting too. Although I’m a little too private to use a feature like this, you can “enlist your phone” to send periodic pressure data to the app’s central database to further enhance your results. I’ve found the reporting system to be pretty useful as well, as the user base seems swarthy enough to the point where people actually send their reports in. Since I’m not going to be flying a plane anytime soon or escaping a natural disaster, Dark Sky has pretty much everything I need in one place. Although the “weather” folder is packed with a bunch of specialized apps, this is the one I use the most.